Fort Meow (PC) Review - Game Reviews | Squackle.com! The Funniest Site on the Net! The question is as old as time itself: Which four-legged beast makes the better domesticated pet? A dog or a cat? 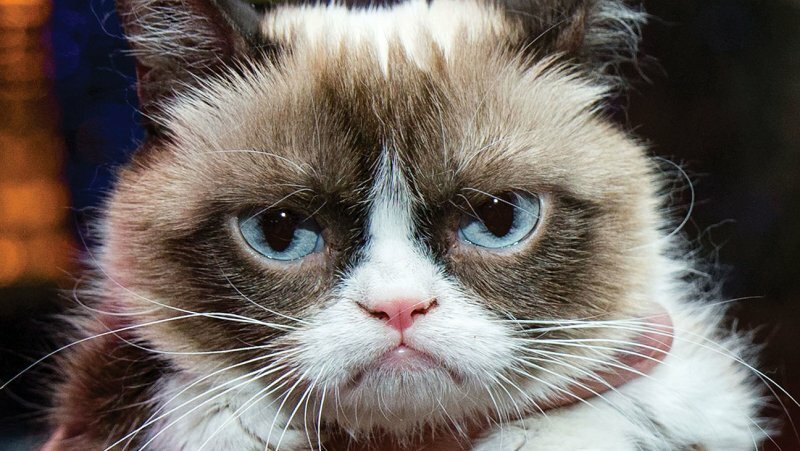 The dog, known for its obedience and loyalty, is commonly known to be “man’s best friend.” On the other hand, cats are known for their independence and for being the little super-villains of the household, which makes them the favorite animal of the internet. Though, thanks to Fort Meow, I now know the answer to this conundrum is dog. It’s definitely dog. 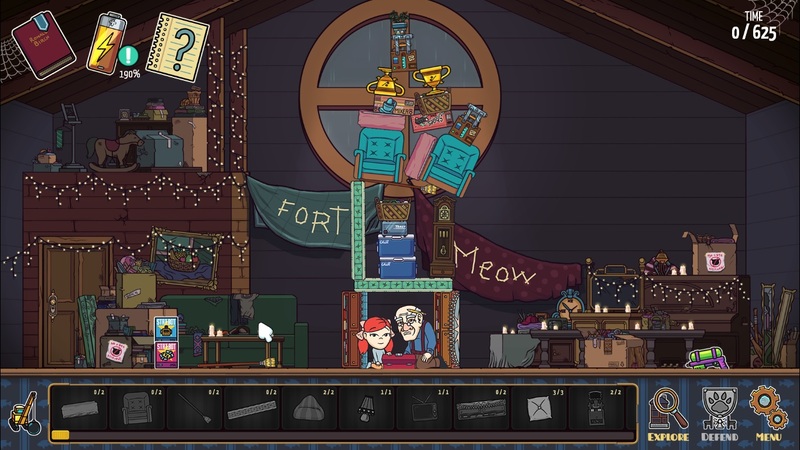 Fort Meow is a physics-based strategy game that involves building forts, cats and bad adult supervision. Playing as young Nia (I see what you did there…), you find yourself at your grandparents’ place only to find them missing. After not calling your parents, and instead rummaging around the attic (like any good horror movie character), the only clue to their whereabouts seems to be hidden somewhere in your grandfather’s journal. 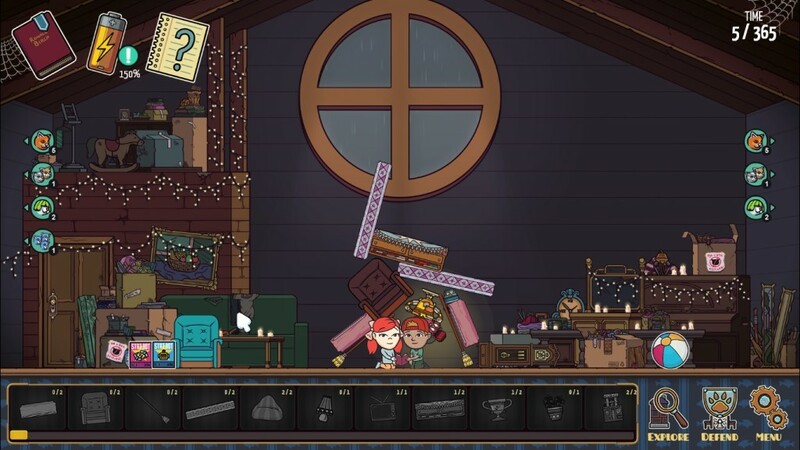 The game then tasks you with building fort after fort with household items to defend yourself against a constant onslaught of cats that want to distract you from reading the journal and discovering their nefarious schemes. Along the way, you encounter your grandfather’s flying robot to help you further explore the house and eventually stop the Catpocalypse… Which all seems like a pretty complicated setup for a tower defense puzzle game about evil cats. Despite the silly and complicated set up, the game itself is actually quite fun. Fort Meow switches between a tower defense and exploration portions and both do well to make the game enjoyable. The tower defense portion of the game is much like Angry Birds, but in reverse. Instead of trying to destroy buildings and those inside of it, you take the role of the person inside of the fort who must build one strong enough to prevent any cat from forcing their way inside. Though, like any good game, the premise may be simple but it still manages to challenge the player. Constantly, I’d find my forts barely surviving and on the verge of collapse. Plus the time mechanic, which serves as a sort of cost for the items in your fort, is an effective way to limit your resources enough to make your forts strong but nowhere near impregnable. Lastly, while the gameplay in Fort Meow is mostly solid, the “physics” that the game mentions as a selling point don’t always play out as planned and would probably leave Einstein scratching his head in confusion. E=What the heck is that?! The exploration portion of the game may be a smaller part but it still manages to do a good job at integrating your expanding amount of fort pieces into the overall plot as you unlock every room in your grandparents’ house. While a few of the items you pick up are simply roadblocks that attempt to withstand the flying cats, others are roadblocks that have rather interesting gimmicks to them. 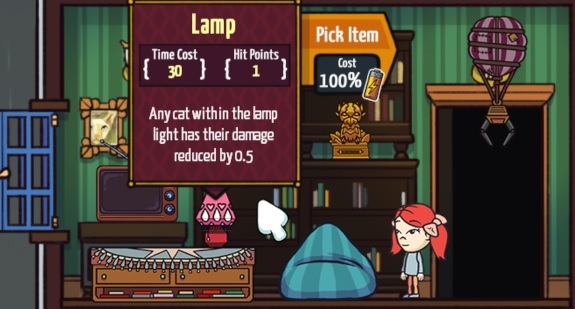 From lamps that halve damage, to boxes that capture kitties and fortify themselves in the process, and even objects that attempt to shoot the felines out of the air, the game offers you a wide assortment of items to build your fort around. Unfortunately, the same amount of imagination wasn’t put into the puzzles used to unlock more rooms in the house. Simply being notes that you unlock with gameplay, they tell you exactly how to solve the uninspired “puzzles” in the game. This makes unlocking more rooms into a meaningless “Where’s Waldo” exercise instead of a fun brain teaser. Like other evil creatures, light weakens cats. On a more positive note, the art style in the game is a treat. Fort Meow uses simple and cartoon-like animation during its cut scenes, a comic style for the dialogue and storybook like drawings during the actual game to great effect. These styles mix well with the story and the atmosphere of the game. To a similar degree, the melody and sound effects are used to a comparable effect. Regrettably, the game does have its downfalls. First, the game is short, coming in at around 2 or 3 hours of content and offering no replayable features such as challenge stages or a “new game plus.” This lack of replayability is a shame even with the small price tag attached to it. I would definitely pay a few more dollars for several extra hours of gameplay. Another of the game’s undoings is the fact that luck plays a moderate part on whether or not your fort will withstand the cat’s flinging themselves against it. Enough times for me to notice, I would use the same fort in the same stage and each time things would play out differently. Whether it would topple over to one side, stand firm but eventually fall under the cat’s assault, or even withstand the full brunt of the cat’s attack seemed to be random and completely arbitrary according to the game’s whims, which took me a bit out of the whole process. Charting this last bit of negative input on a mostly fun game as personal preference, I feel that the PC port would be inferior to the iPad version. This game seems like a fun portable companion to help offset any boredom while outside or while looking to kill some time before whatever activities the day has in store. Plus, playing it in short spurts while outside, as opposed to a sit down session at the computer, would probably make the game seem a bit longer in comparison. 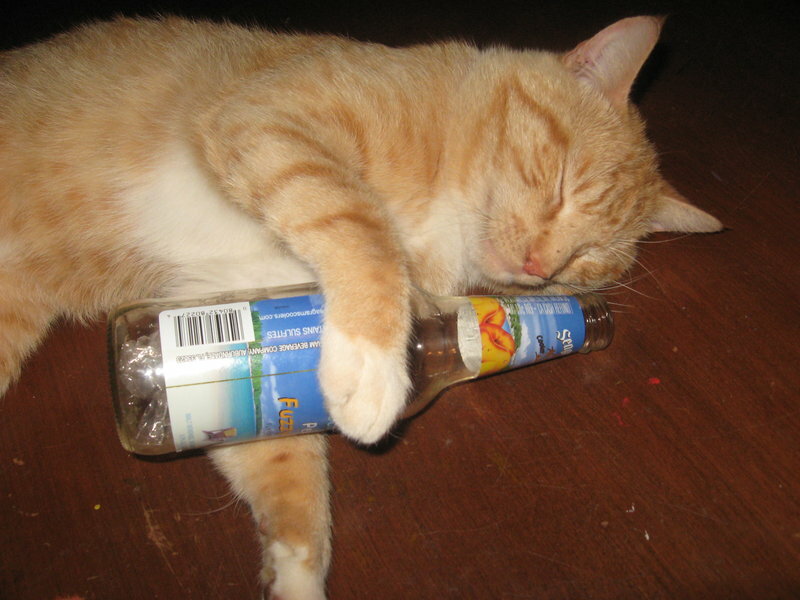 bad decisions like this cat here. Don’t get me wrong, though. While Fort Meow has its hiccups I did still find my time with the game enjoyable. The only real decision to make is if these hiccups are enough to dissuade you from buying the game at the low 8 dollar price tag. If the game has anything else going for it, Fort Meow gives me another good reason why I prefer dogs over those evil cats. A reviewable copy of Fort Meow was provided to Squackle.